Top Bank CEOs Questioned About Their Pay In House Hearing Citigroup's CEO received $24 million in compensation last year, while the median employee pay at the bank was just under $50,000. Executive pay was one of the issues at a House hearing Wednesday. 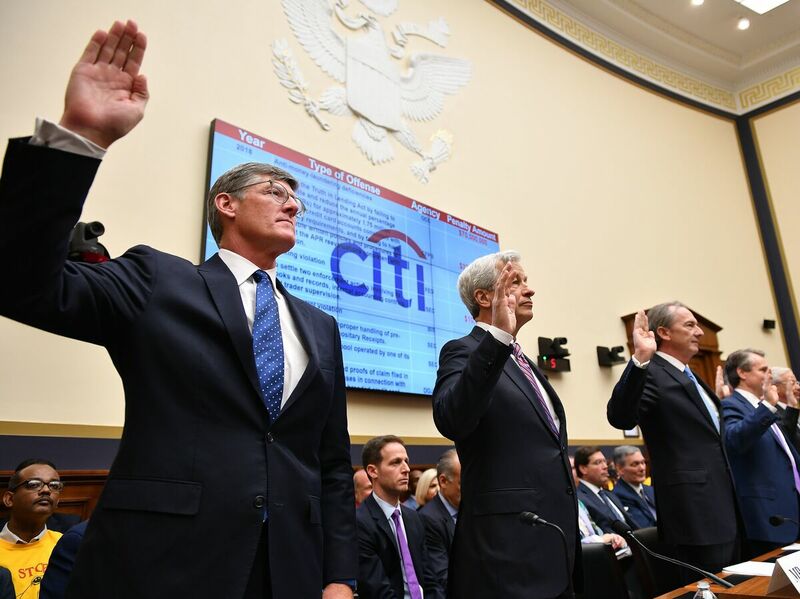 Citigroup Chief Executive Officer Michael Corbat (from left), JPMorgan Chase CEO Jamie Dimon and other top bank executives are sworn in before testifying before the House Financial Services Committee on Wednesday. "Ten years ago, the CEOs appeared before this very committee to discuss the financial crisis and the massive bailout taxpayers provided," said committee Chairwoman Maxine Waters, D-Calif. "A decade later, what have they learned? Are they helping their customers and working to benefit the communities they serve? Or are the practices of these banks still causing harm?" But much of the questioning veered into executive pay and consumer issues. Democrat Nydia Velazquez of New York noted that Citigroup CEO Michael Corbat received $24 million in compensation last year, while the median bank salary is less than $50,000. "Does this ratio seem fair to you?" she asked Corbat. "My compensation is decided by our board and voted on by our shareholders," he replied. "If you were an employee, and you saw your boss making $486 for every dollar you make, how would you feel about that situation?" Velazquez asked. "I would be hopeful there's opportunity to continue to advance within the firm," he said. "Unbelievable," Velazquez said. "And this is why people that live in a bubble or ivory towers cannot understand why there's so much anger out there." Rep. Carolyn Maloney, D-N.Y., told JPMorgan Chase CEO Jamie Dimon his bank has been the subject of numerous complaints about overdraft fees, citing data from the Consumer Financial Protection Bureau. "You're essentially gouging your most vulnerable clients, the ones that are living paycheck to paycheck," she said. Dimon replied that bank customers can choose accounts that have different overdraft fee structures. "The overdraft policy as it stands today, which was changed, by the way, in 2009, is that the client has to opt in," he said. "They are given a choice on opening the account on whether they want to have overdraft features or not." Also testifying at the hearing were Bank of America's Brian Moynihan, David Solomon of Goldman Sachs, Morgan Stanley's James Gorman, State Street's Ronald O'Hanley and Charles Scharf of Bank of New York Mellon. It's the first time bank CEOs have appeared before the committee since the Democratic takeover of Congress and the first joint appearance by the heads of all seven banks on Capitol Hill since the financial crash. Perhaps in anticipation of Wednesday's hearing, Bank of America announced it would raise its minimum wage to $20 an hour by 2021. Ranking member Patrick McHenry, R-N.C., accused Democrats of staging a political stunt and said the committee would be better focused on relevant issues like the impact of Brexit on the U.S. financial system. "Why are we here?" he asked. "I fear our colleagues on the other side of the aisle are here to attack our economic system, attack the nature of our market. I fear my friends want to dictate social and environmental policy through government mandates on banks. That's not the right approach." McHenry questioned the CEOs about whether Britain's departure from the European Union without a firm plan in place would destabilize the global financial system. Most said it would be a challenge but not a systemic risk. The heads of Citigroup and Bank of New York Mellon said they have already taken steps to relocate their British operations to other European countries in anticipation of a hard Brexit.